REN Tonic Moisture Mist // I was pretty lucky to find this in the Space NK sale as it looks like it's still out of stock on every website. It's such a shame as it's one of my favourite hydrating toners and I'm going to try to make this last as long as I can. It helps to soothe my sensitive skin and also add an extra bit of moisture into my skin. The closest I have come to find a dupe to this is balance Me's version. Lush The Comforter Bubble Bar | £4.75 // I've already started using this one hence why it' already crumbled up. I find the bubble bars easier to use if I break them up straight away as they dissolve quicker in the water when in smaller pieces and also the longer you keep bubble bars, the harder they get so it's not always easy to break them up after so many months. The Comforter is one of my favourite scents and one I will always repurchase as long as it's still available. It's quite a sickly sweet fruity scent but I still love it since a lot of the bath products I use are mostly herbal and relaxing scents so it makes a nice change. The Comforter is also one of the larger bubble bars available from Lush so despite the slightly higher price, I can usually get about six baths out of it. Lush Rub Rub Rub Body Scrub | £8.75 // I think this is my third tub of Rub Rub Rub and I still love it just as much as the first time I bought it. Unlike some body scrubs I've used recently, this works amazingly well and is nicely abrasive without harming the skin. It's a salt based scrub, which I prefer along with sugar, as it dissolves in the water after you've rinsed it off and there isn't any mess left in the bath. It has quite a strong floral scent, a mix of jasmine and mimosa, so might be one to smell in store if you're not a huge fan of those two. I normally don't like strong floral scents but I really like this one. If you take back five empty full-size black pots to a Lush store then you get a free fresh face mask in return which is always a bonus. Lush Dreamwash Shower Smoothie | £9.95 // This is another one that I think is my third repurchase and is an essential for me. It's calming on the skin and one I like to use when my eczema is acting up. The key ingredients are calamine, aloe vera gel and chamomile oil to keep skin soft and moisturised. It is essentially a shower gel but the consistency and formula is quite different as it is more of a cream. It works perfectly with Lush's Dream Cream and it really helps to keep my eczema at bay. I haven't tried Rub Rub Rub Body Scrub by Lush. 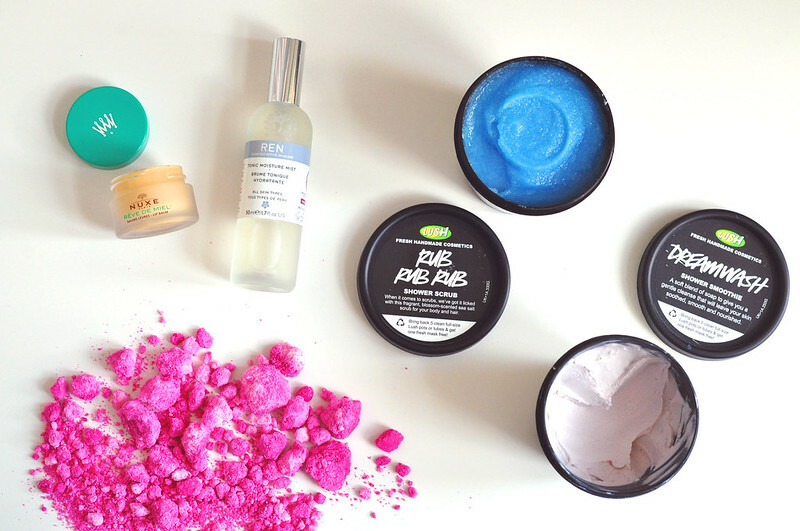 I love every Lush product I have used and it sounds right up my street. Next time I am in Lush I might give it a go.